If you're using the Calxa Online browser app, refer to these articles instead. The Default Accounts screen in Calxa allows you to nominate important accounts to certain categories (such as Bank, Inventory etc.) for KPI, cashflow, and budget reporting purposes. This help note will guide you through the process of nominating accounts and their purpose. Click on the Default Accounts button. Select the appropriate organisation from the Current Organisation list. Select the category you wish to nominate accounts for (for example, the Bank category). In all of the categories except for General, nominated accounts are listed on the left hand side, and available accounts for nomination are listed on the right hand side. To nominate accounts from the Available Accounts list you can either drag and drop the account you want nominated to the Nominated Accounts list or select the account from the Available Accounts list and click on the Add button. To remove nominated accounts out of the Nominated Accounts list you can either drag and drop the account you no longer want nominated over to the Available Accounts list or select the account from the Nominated Accounts list and click on the Remove button. In the General category accounts are nominated by selecting the appropriate account from the drop down menus. To nominate schedules you should also select the appropriate schedule from the drop down menus. See Default Schedules for a description of the default schedules. Note - To restore accounts to their default nomination, you may click the Restore Default button. The Paid account and Collected account are used for calculating tax collected and tax paid, select the appropriate liability accounts. 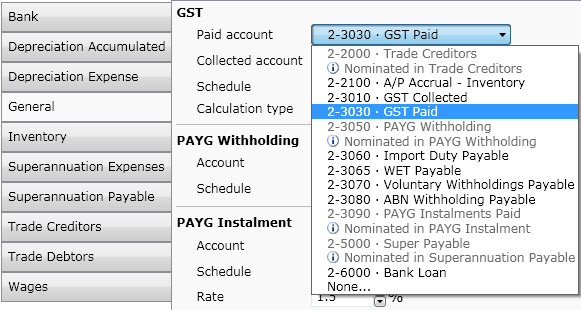 Also select the Schedule and Calculation type that is used to pay your GST. See Default Schedules for a description of the default schedules. Nominate all bank accounts that you would like to include in cashflow calculations. Calxa is unable to determine which bank accounts will be used for which transaction, therefore for cashflow purposes multiple accounts will be treated as a combined virtual account. This means if you would like your bank balance to reflect your combined bank balances, nominate all appropriate accounts. These accounts determine a debtors and creditors balance which are used to calculate debtor and creditor days KPIs and cashflow profiles. Nominate all Trade Debtor accounts and Trade Creditor accounts. Multiple accounts will be treated as a combined virtual account. Calxa will calculate your accumulated depreciation budget based on your expense budgets. You may nominate depreciation or amortisation accounts in these categories. The cashflow type will be set to none to ensure there is no cashflow effect from budgets on these accounts and multiple accounts in the accumulated depreciation category will be treated as a combined virtual account. Calxa will calculate your superannuation payable liability based on your superannuation expense budget. Once again multiple accounts will be handled as a combined virtual account. 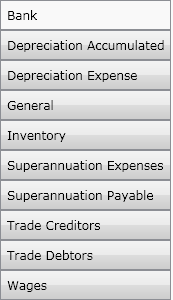 In addition to nominating all accounts that apply you should also set a payment schedule for your superannuation. 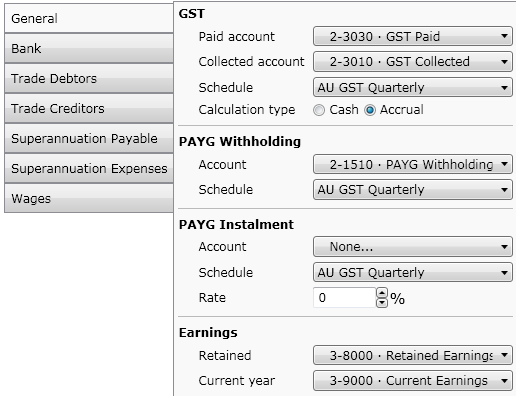 The schedule determines the frequency of your superannuation payments. The accounts nominated in this category determine which accounts in your balance sheet are used for inventory or stock. The combined balance is used in some KPI calculations. Calxa Premier users may set custom cashflow schedules however there are numerous default schedules available. Following is a list of default schedules and their details. For activity in a given month the payment will be made in the following month. For activity in a given quarter the payment will be made in the following month. The activity periods are Jan-Mar, Apr-Jun, Jul-Sep and Oct-Dec.
As per the quarterly schedule, except the December ending quarter will be paid in February. For activity in a given quarter the payment will be made in the second month following the end of that quarter. The activity periods are Jan-Mar, Apr-Jun, Jul-Sep and Oct-Dec.
For activity in the 2 monthly periods the payment is made in the following month, with an exception for March and November ending periods which are paid in May and January respectively. The activity periods are Dec-Jan, Feb-Mar, Apr-May, Jun-Jul, Aug-Sep and Oct-Nov.
For activity in the 2 monthly periods the payment is made in the following month. The activity periods are Jan-Feb, Mar-Apr, May-Jun, Jul-Aug, Sep-Oct and Nov-Dec.
For activity in the 6 monthly periods payments are made in the following month. The activity periods are Jan-Jun and Jul-Dec. The activity periods are Apr-Sep and Oct-Mar where payments are made in Oct and May respectively.